Summary of the six first chapters of the first album. Thanks to Serge Simon. Andreas' attention to colors expresses itself in other moments as well. Thus at some point he had to make a summary of past stories for Tintin/Hello BD (fr); Kuifje (nl), because they had waited a long time with the publication of the sequel. This page (site-editor: Fragments Summary) Andreas shaped into a disc, with Rork in the middle and the figures that stage the episodes around him, each story a segment of the circle, that isn't closed since the story isn't over. This page was printed in black-and-white in the album Fragments but in Tintin/Hello BD (fr); Kuifje (nl) it appeared in color. It was performed as a colorful disc: the segments of the disc each were performed in shades of one color, and this main color passed into the next segment's color: from yellow through green to blue, purple and red. 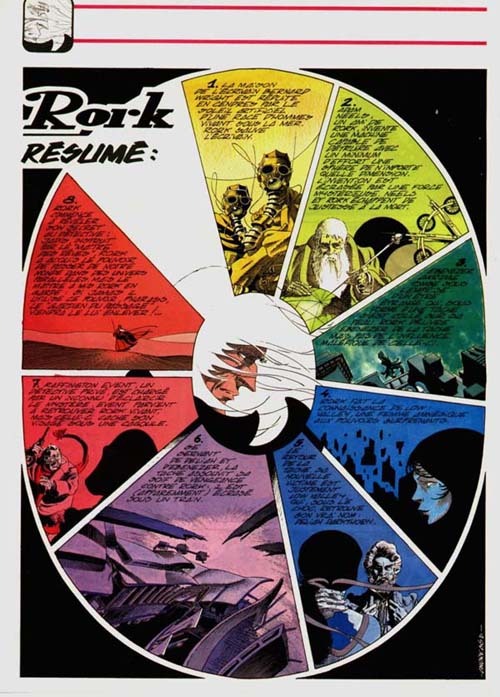 The center space, with Rork in it, was white: Rork is the sum of all parts.